A new policy by the U. S. Military classifies observations by government spacecraft of incoming fireballs, meteorites and asteroids from space as top secret. This is an unexpected change in policy since NASA began launching satellites to study the incoming objects that crash through Earth's atmosphere, sometimes lighting up the sky as they burn. Some of the larger space rocks are big enough that they are not completely destroyed and they hit the ground. When found, they have been considered a byproduct data bonanza for scientists. 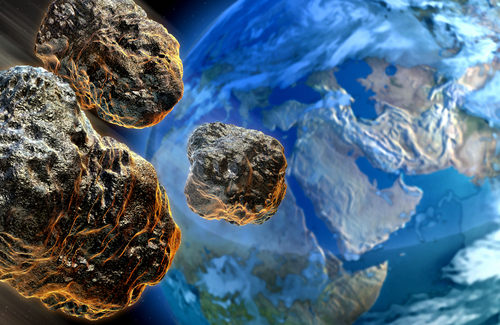 Under the new military policy, all space rocks found on U. S. soil are now classified. There has been no explanation for the change. "It's baffling to us why this would suddenly change," one unidentified researchers told SPACE.com. The scientific community has enjoyed a cooperative arrangement with the military for the past 15 years and given the opportunity to study space rocks to learn their makeup and even their origin. Scientists warn that under the new classification rule, all research into possible threats from space will be hampered, and public understanding of sometimes dramatic sky explosions will not be explained. The secrecy may lead to theories of government conspiracy, alien invasion and fear of the unknown. A report on the Danger Room website suggested that the secrecy might be centered around the technology being used by the Air Force in the secret satellites now orbiting the planet. They are not only watching for incoming objects from space, but their primary mission is to watch for things like ballistic missile launches and other military activities on the ground by other nations. "Besides precise location data, the satellites can also apparently measure things like exact blast energies, which would be extremely helpful for scientists who are trying to figure out how worried we should be about getting our entire civilization flattened by a rogue comet," the story said. The writer suggested that the Air Force is caught between wanting to keep the public informed about potential dangers dropping out of space but not tipping us off on the top secret technology being used in man-made satellites. "But it's in the best interests of the entire planet that researchers be able to use this information to hep predict and possibly prepare for future encounters with near-Earth objects. "It might seem a little bit paranoid to be concerned about this stuff, but a sizable asteroid strike is one of those things that has the potential to do some serious damage with little or no warning," the writer said. "Statistically, meteorites the size of trucks hit the upper atmosphere about once a year, and if they make it through, they effectively turn into nukes. The last one of these blew up over the Eastern Mediterranean in 2002, but it it had decided to end itself over a city or something, we'd probably be having a much more serious discussion about planetary defense systems right now."